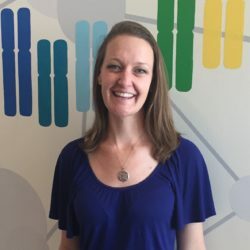 Dr. Robertson is a Product Scientist at 23andMe focused on translating complex scientific topics into easy-to-understand language for all audiences. She loves to help people learn, talk about, and benefit from science that can improve health and well-being. She believes learning genetics is fundamental to understanding human nature and critical to the future of global human health. Dr. Robertson studied nutrition, exercise and health science at UC Santa Barbara while completing her BS in Pharmacology. After working in the pharmaceutical industry for a few years, she completed a PhD at UCLA in Neuroscience and Medical Pharmacology. At UCLA she studied how exercise improves outcomes for addiction treatment, and examined the relationship between dopamine signaling in the brain and cognitive functions like self control, impulsivity and emotion regulation. Dr. Robertson is passionate about leveraging science and technology to promote behavior changes that improve health and quality of life throughout the lifespan. Please don’t hesitate to reach out to her, she’d love to hear from you.